THIS IS ONE OF THE PRETTIEST APRONS WE HAVE IN OUR INVENTORY! IT’S MADE OF 100% NYLON IN A PRETTY PINK COLOR AND THE POCKETS HAVE A PRETTY STITCHED FLOWERS DESIGN. THERE ARE TWO POCKETS AND THEY ARE DOUBLES – A SMALLER POCKET (FLOWERS) IN FRONT OF A LARGER POCKET (LITTLE BOWS). THIS IS A VINTAGE APRON PROBABLY RECEIVED AS A GIFT AND NEVER WORN/USED. IT STILL HAS THE ORIGINAL TAG – “BECA ORIGINALS, EXCLUSIVELY DESIGNED BY MISS HELEN”. BACK OF TAG HAS “BECA-HELMAN CO, 43B – 1ST AVE NO, MPLS.1, MINN”. SUPER ITEM!! 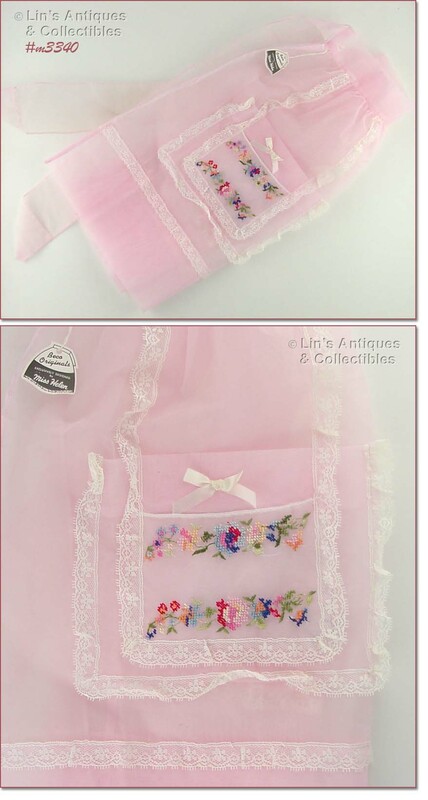 THIS IS SUCH A PRETTY HALF APRON! THE COLORS ON THE FANS AND ROSES ARE GORGEOUS! PLEASE SEE PHOTOS. THIS IS A VERY NICE CALIFORNIA SOUVENIR APRON! IT HAS LOTS OF DETAIL AND IS IN WONDERFUL CONDITION – PLEASE SEE PHOTOS. THIS IS A LOVELY APRON WITH AN UNUSUAL DESIGN AND USE OF MATERIAL! THE FLORAL PRINT MATERIAL IS SO COLORFUL AND THE ADORABLE POCKET REMINDS ME OF A FLOWERPOT. VERY PRETTY APRON! 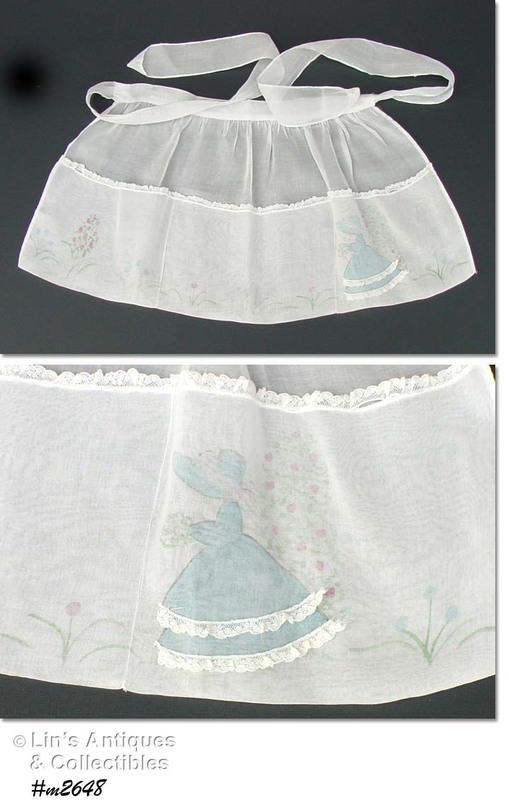 THIS IS AN OLDER APRON AND IS ONE OF THE MORE UNUSUAL ONES WE HAVE LISTED! IT HAS A LADY/GIRL HOLDING A BOUQUET OF FLOWERS AND THERE ARE OTHER PRETTY FLOWERS AS WELL – TULIPS AND PERHAPS A ROSE TRELLIS – JUST VERY PRETTY! OF ALL THE HAND-MADE APRONS WE HAVE LISTED, THIS ONE IS BY FAR THE MOST DETAILED! 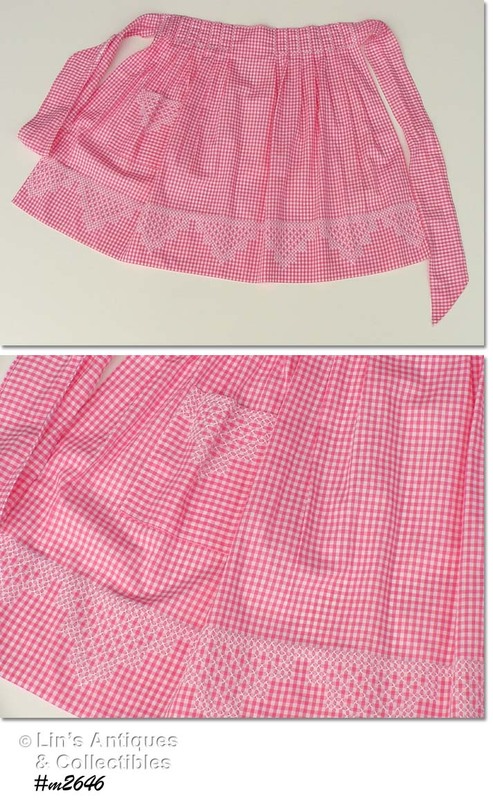 MADE OF PINK AND WHITE CHECK FABRIC, IT HAS SMOCKING AT THE WAIST AND ALSO ON THE LARGE SINGLE POCKET. THE APRON IS CURVED/ROUNDED (RATHER THAN HAVING THE CONVENTIONAL SQUARE SHAPE) AND THE POCKET HAS THE SAME SHAPE. THE APRON IS FINISHED WITH WIDE WHITE RICKRACK ON THE EDGES AS WELL AS ON THE POCKET. THE RICKRACK WAS TACKED ON WITH PINK EMBROIDERY THREAD AND THEN RECEIVED A LONG STITCH – THAT EXTRA STITCHING NOT ONLY ADDS EXTRA COLOR BUT IT KEEPS THE TRIM FLAT. WOW! ANOTHER PRETTY APRON WITH CROSS-STITCH (CHICKEN SCRATCH) DESIGN! THIS APRON IS A GORGEOUS PINK AND WHITE CHECK AND IT HAS THE HUCK TOWEL TYPE DESIGN – SAME AS ON THE BLUE APRON IN OUR ITEM #M2643. EXCELLENT ADDITION TO A COLLECTION OR TO WEAR! BEAUTIFUL COLOR! IT’S UNUSUAL TO FIND CROSS STITCH GINGHAM APRONS WITH WORDING ON THEM! THIS ONE IS GREEN AND WHITE CHECK AND HAS THE WORDS “MERRY CHRISTMAS” CROSS-STITCHED IN RED! I PURCHASED THIS APRON AT AN ESTATE SALE IN INDIANA. IT IS IN EXCELLENT UNUSED CONDITION. APRON HAS BEEN LAUNDERED, LIGHTLY STARCHED AND IRONED (BY ME), AND IS FROM A SMOKE FREE ENVIRONMENT. LOVELY ITEM FOR USE OR DISPLAY -- WOULD ALSO BE AN EXCELLENT CHRISTMAS GIFT! 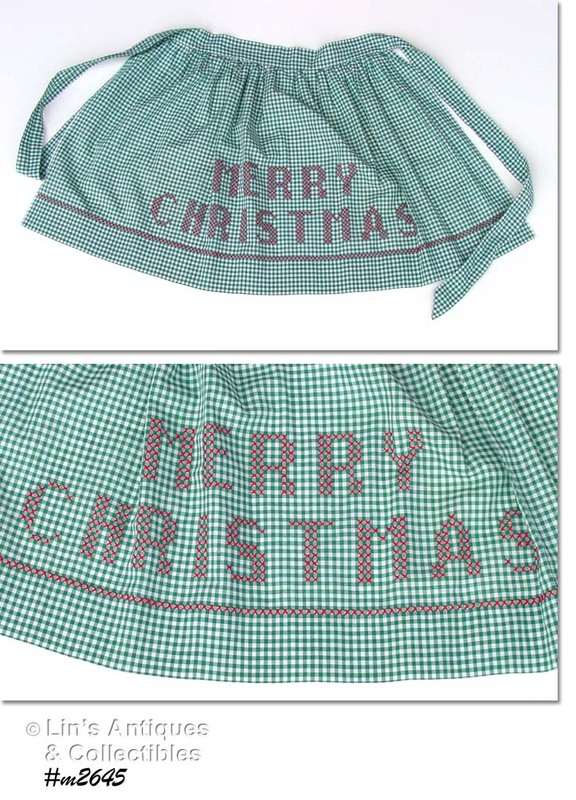 THIS LISTING HAS A COLORFUL VINTAGE CHRISTMAS GINGHAM APRON! 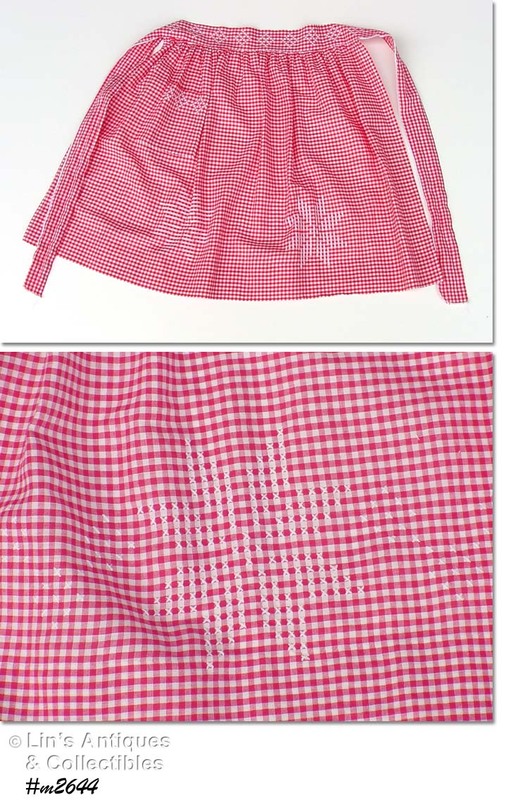 IT’S RED AND WHITE GINGHAM WITH A WHITE CROSS-STITCH DESIGN OF SNOWFLAKES. THIS STITCHING WAS VERY POPULAR IN THE 1970S AND AT THAT TIME WAS CALLED CHICKEN SCRATCH. THE PATTERN/DESIGN ON THIS APRON IS OF SNOWFLAKES (OR COULD BE POINSETTIAS) -- SECOND PHOTO SHOWS CLOSE-UP. APRON APPEARS TO HAVE NEVER BEEN USED. I PURCHASED IT SEVERAL YEARS AGO AT AN ESTATE SALE IN INDIANA. IT HAS BEEN LAUNDERED, LIGHTLY STARCHED, AND IRONED (BY ME) AND IS FROM A SMOKE FREE ENVIRONMENT. THESE TWO GINGHAM APRONS ARE IN EXCELLENT CONDITION AND APPEAR TO HAVE NEVER BEEN WORN! THEY HAVE CROSS-STITCH DESIGNS AND THIS WAS CALLED “CHICKEN SCRATCH” (WOULD NOW BE COUNTED CROSS-STITCH)! THE YELLOW APRON HAS A DARK YELLOW/GOLD COLOR CROSS STITCH FLORAL DESIGN WHILE THE BLUE ONE HAS A GEOMETRIC TYPE DESIGN (OFTEN SEEN ON HUCK TOWELS). THE ATTENTION TO DETAIL IS WONDERFUL – ESPECIALLY ON THE BLUE APRON. 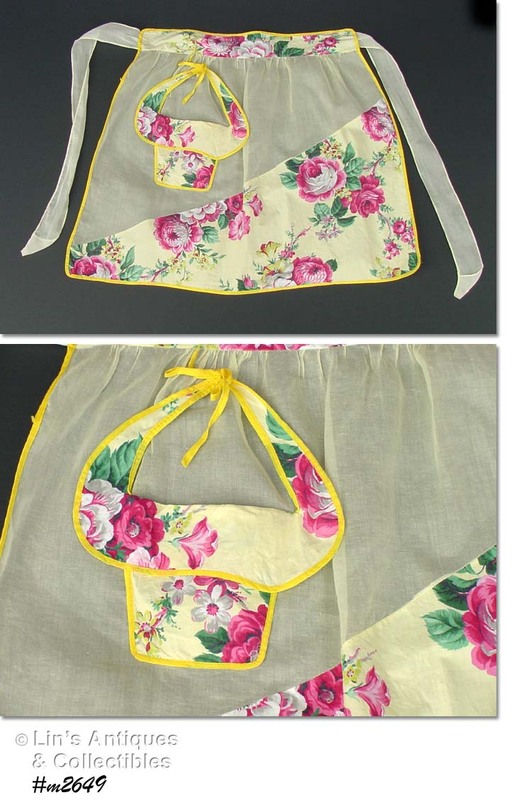 THESE ARE LOVELY APRONS TO WEAR OR DISPLAY IN A COUNTRY KITCHEN. THESE TWO CHRISTMAS APRONS HAVE BEEN IN MY COLLECTION FOR A NUMBER OF YEARS SO I’M LISTING THEM TOGETHER! THE RED ON HAS A LARGE POCKET THAT’S ACTUALLY A CHRISTMAS HANKY COVERED WITH RED POINSETTIAS! 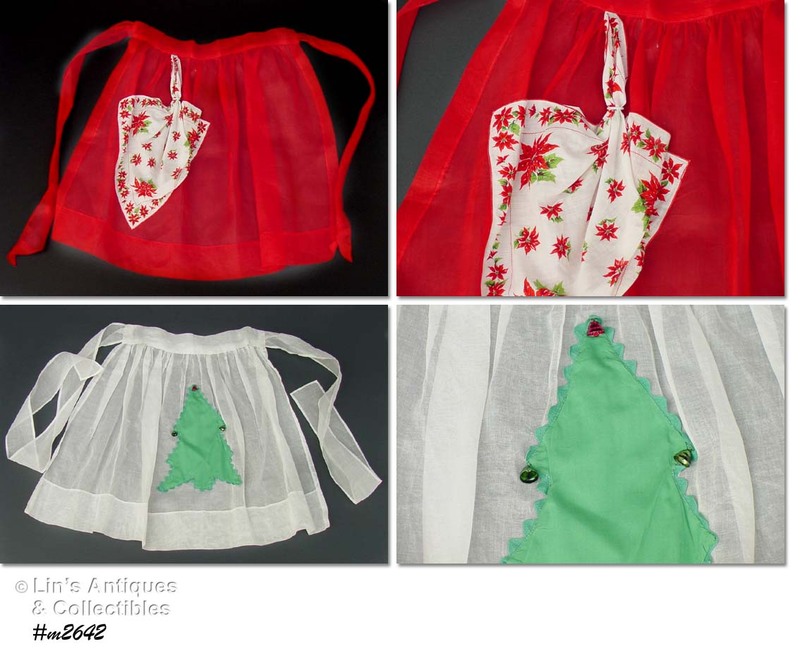 THE WHITE APRON HAS AN APPLIQUÉD GREEN CHRISTMAS THREE THAT HAS 3 LITTLE METAL BELLS ATTACHED – ONLY THE RED BELL HAS A CLAPPER SO IT MAKES A NICE LITTLE TINKLING SOUND WHEN YOU MOVE! CHRISTMAS APRONS ARE BECOMING DIFFICULT TO FIND – THESE TWO ARE GREAT! THE HANDWORK ON THIS CROCHET APRON IS EXCEPTIONAL! THE APRON TIES/STRINGS ARE NICE AND LONG AND EVEN THEY HAVE A LOVELY DESIGN. PLEASE SEE THE PHOTOS TO TRULY APPRECIATE THIS EXTRA NICE APRON AND TO SEE THE WORK AND TIME THAT WENT INTO IT. SUPER! 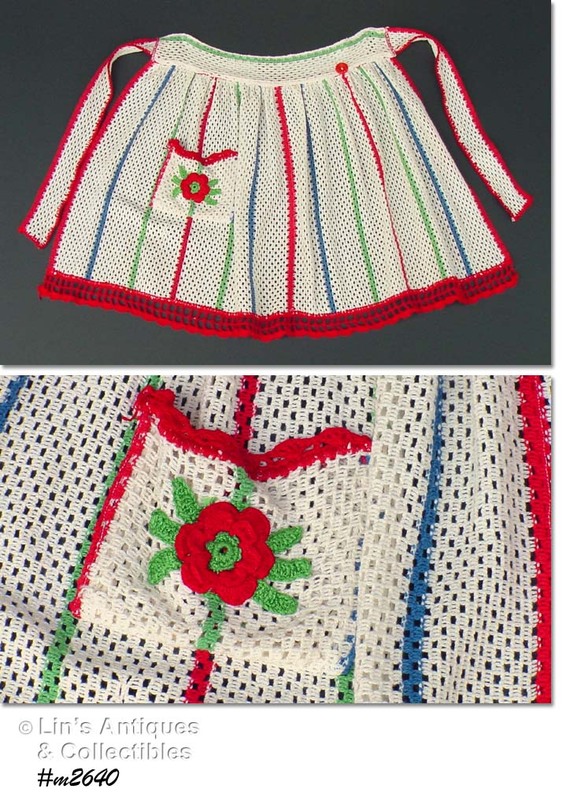 THIS CROCHET APRON IS SOMEWHAT DIFFERENT THAN THE OTHERS WE HAVE LISTED – IT’S MADE OF CROCHET/OPEN-WEAVE DISHTOWELS! THEY HAVE BEEN JOINED TOGETHER AND DRESSED UP WITH PRETTY CROCHET AT HEM AND A LOVELY CROCHET FLOWER HAS BEEN ATTACHED TO THE SINGLE POCKET. THERE IS ALSO A BUTTON ATTACHED TO THE WAISTBAND AND WOULD PROBABLY HAVE HAD A SMALL HAND TOWEL ATTACHED. NEAT APRON – EXCELLENT CONDITION! THIS IS ONE OF THE PRETTIEST CROCHET APRONS I’VE EVER SEEN! THE ATTENTION TO DETAIL IS SO NICE – JUST LOOK AT THE BOWS AT THE END OF THE RIBBONS. LOVELY! THESE APRONS ARE BOTH COLORFUL AND IN EXCELLENT CONDITION! BOTH ARE HALF APRONS (WAIST APRONS), ONE HAS RED FLOWERS AND THE OTHER HAS PINK. NOTE THE DETAIL ON THE WAIST BAND OF THE APRON WITH RED FLOWERS – 3 RED FLOWERS HAVE BEEN SEWN ONTO THE WAISTBAND! THESE ARE EXTRA NICE APRONS TO DISPLAY OR WEAR. CUTE HALF APRON! 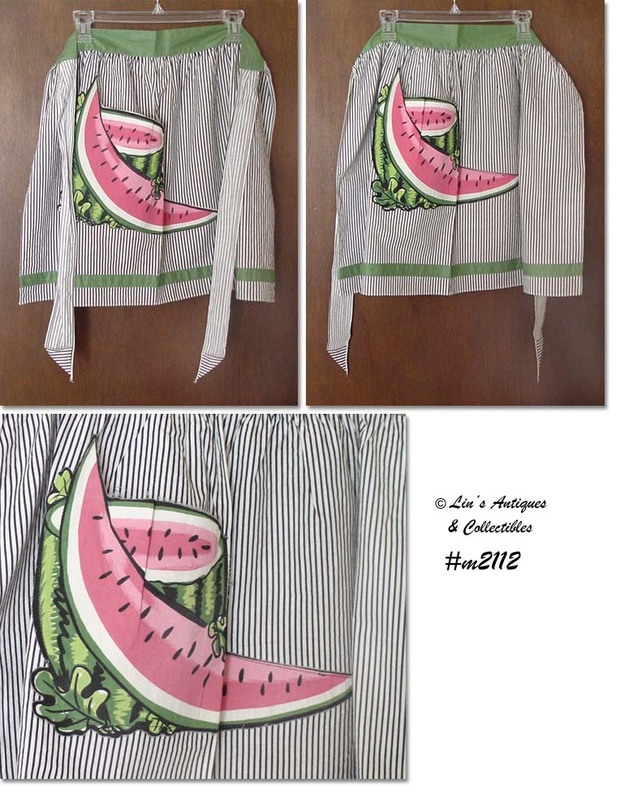 IT HAS BLACK STRIPES, GREEN WAISTBAND, AND THE POCKET LOOKS LIKE A WATERMELON. WE HAVE1 AVAILABLE. 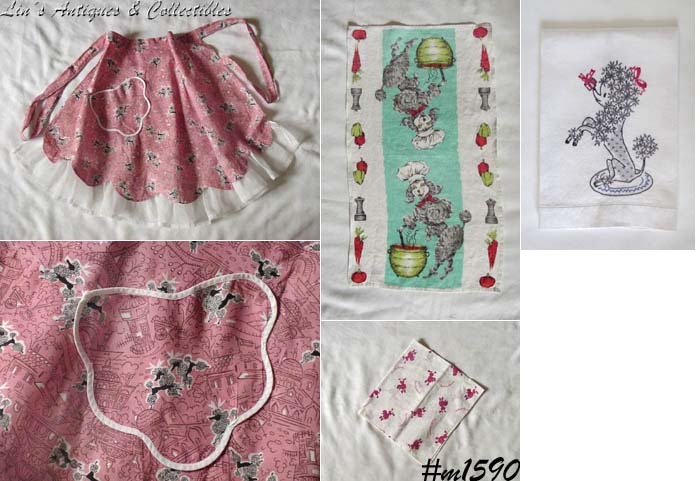 FOR ALL YOU COLLECTORS OF POODLE RELATED ITEMS, THIS LISTING IS FOR YOU – LISTING HAS A CHEF POODLE KITCHEN TOWEL, A GUEST TOWEL WITH AN EMBROIDERED POODLE, AND A POODLE APRON! THE COLORFUL TOWEL SHOWS GRAY POODLES COOKING VEGETABLES – THIS IS A “BOOK” PIECE AND CAN BE SEEN IN “FUN LINENS & HANDKERCHIEFS OF THE 20TH CENTURY” WITH A PRICE RANGE OF $25-$35. THE POODLE GUEST TOWEL HAS A HAND EMBROIDERED FANCY GRAY POODLE. ALSO INCLUDED IN THIS LISTING IS A POODLE APRON! PLEASE SEE PHOTOS TO APPRECIATE THIS WONDERFUL HANDMADE APRON – IT WAS MADE BY ROGER’S MOM AND I ESTIMATE IT TO BE FROM THE 50’S/60’S -- ROGER’S MOM WAS AN EXTRAORDINARILY TALENTED SEAMSTRESS AND NEEDLE WORKER. I DON’T BELIEVE THIS APRON HAS EVER BEEN WORN. 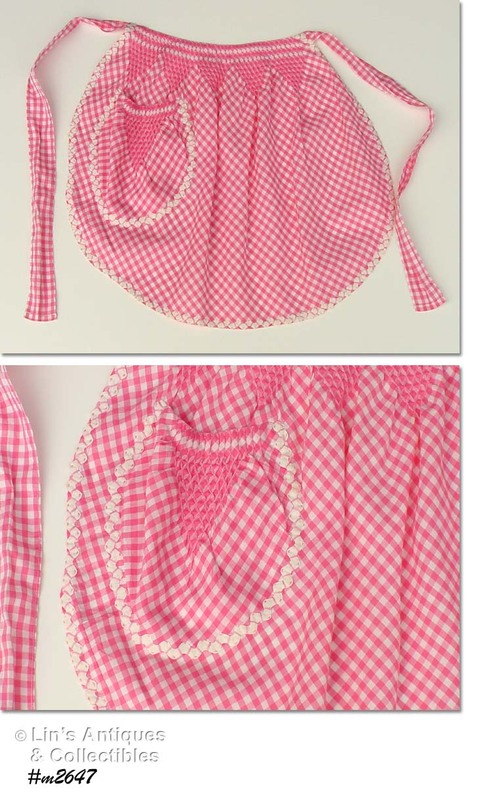 THESE APRONS ARE LOVELY – THERE’S A BLACK AND WHITE GINGHAM AND A BROWN AND WHITE GINGHAM! THEY ARE DECORATIVELY EMBELLISHED WITH WHAT IS NOW SIMPLY CALLED CROSS STITCH BUT WHEN ORIGINALLY STITCHED ON GINGHAM IT WAS CALLED “CHICKEN SCRATCH” (BEFORE COUNTED CROSS STITCH!). APRONS ARE IN NEW, NEVER USED CONDITION. VERY PRETTY!